There are several reasons why a new business, or any business, starts to experience financial problems. The lack of a credit history, or bad credit, prevents banks from being interested in offering assistance. A company that is seeing success will start to see its orders start to outpace the cash flow needed to fill those orders. It isn't long before that essential business element, cash, is in low supply. That is when a good business owner starts to explore all of their options. What Is A Receivable Factoring Company? Receivable factoring companies are commercial finance companies that can turn your outstanding invoices into cash quickly. The important thing to remember is that an invoice factoring company does not lend money, like a bank. The money you are getting is money you have already earned through your invoiced sales. The factoring company just makes sure that you get that money faster. 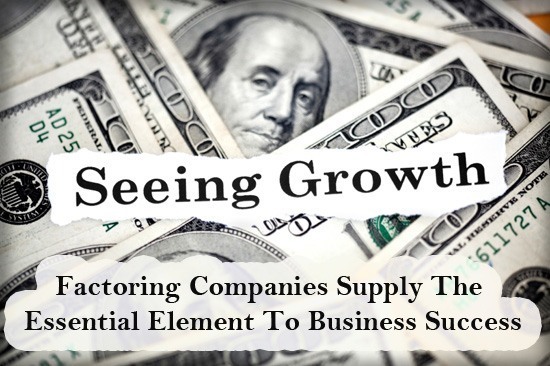 So what is a factoring company? It is the kind of financial organization you turn to when the bank will not help. It is a financial organization that looks at your hard work in generating invoiced sales as an asset to your organization instead of just another statistic. It could be the only financial services organization standing between your company and closing your doors. What Does My Company Need To Do To Utilize A Factoring Company? As with any financial organization, the first step in dealing with receivable factoring companies is to pick up the phone and give one a call. You will find that the top factoring companies have helpful decision makers who are there to answer your questions and get you the information that you need. From there, you go through the application process and get your answer the same day. Once your account is set up, the receivable factoring company will start to process your invoices and begin funding your cash flow. You can get a portion of your invoice face values up front and in a matter of hours. The remainder of your cash, minus the reasonable factoring fees that you are informed of up front, goes into your account after your client has paid their bill. Did you notice that there has been no mention of submitting your credit information? That is because you don't have to. How Do Receivable Factoring Companies Fund Businesses Without Getting Credit Information? Since a factoring company is only interested in your outstanding invoices, it has no need to worry about your company's credit score. All of the decisions a factoring company make are based on the creditworthiness of your clients. As long as you did your job in screening your clients properly, then you should be able to benefit from the strength of your client base. A factoring company goes through your aging reports, invoices, and customer base to determine things like your advance rate and factoring fees. The advance rate is the percentage of a particular invoice that will deposited into your account in a matter of hours and the factoring fees are calculated and revealed to you upfront. There are no hidden fees and no recurring monthly charges to worry about. The lifeblood of business is cash and there are few things more important to your company than its cash flow. When the banks will not help you, it is reassuring to know that you still have options. The next time you need help stabilizing your cash flow, remember that help from a professional invoice factoring company is only a phone call away.